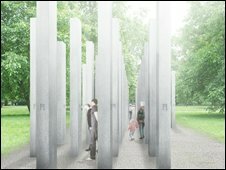 A £1m memorial of 52 stainless steel pillars is to be erected in memory of those killed in the 7 July London bombings, relatives have revealed. The columns, one for each victim, will be grouped together in four clusters, representing the four separate attacks that took place in the summer of 2005. One bereaved father said they would be as "indestructible as the memories" relatives retained of those killed. 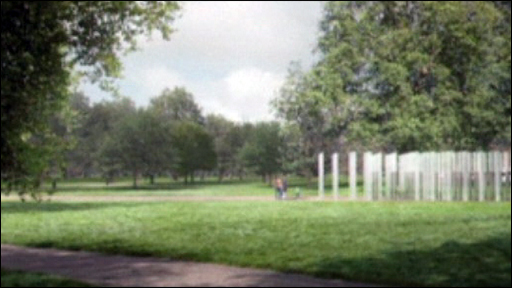 The memorial will be unveiled in London's Hyde Park on 7 July next year. Each of the three-metre columns will be inscribed with the date, time and location of each of the four separate attacks. Visitors will be free to wander around them. A plaque inscribed with the names of the 52 victims will also be placed in the grass banks at the far eastern end of the memorial. Grahame Russell, who lost his son Philip in the bombing at Tavistock Square, said many ideas originating from victims' families were incorporated in the design and that its development had taken time because they wanted "a proper memorial". "The stelae remind me that prior to July 7 these 52 people that died stood tall in this world, the material itself is as indestructible as the memories we have of them," he added. Julie Nicholson, who stood down as vicar in Bristol because she felt unable to forgive her daughter Jennifer's killer, said she felt it would be "difficult" to find a memorial that would "express everything that needs to be expressed". But she said she was reassured when designers stated their intention "was to find a silent thing that can eloquently say the unsayable". Saba Mozakka, whose mother Behnaz was killed at King's Cross, added that the memorial was "also about giving something back to the city". Artist Antony Gormley, creator of the Angel of the North, has acted as an independent adviser for the memorial. He said the monument was "an opportunity for loss victims to be in contact with the living". The public can view the design on its website from next week.